Patches of chain-like molecules placed across nanoscale particles can radically transform the optical, electronic, and magnetic properties of particle-based materials. Understanding why depends critically on the three-dimensional features of these “polymer nano-patches”—which are tantalizingly difficult to reveal at a scale spanning just billionths of a meter. Now, scientists have used cutting-edge electron tomography techniques—a process of 3D reconstructive imaging—to pinpoint the structure and composition of the polymer nano-patches. The results, published earlier this month in the journal Nature, “lay the foundation for new nanoscale architectures that could potentially enhance technologies such as self-assembled solar cells and catalysts," said lead author Eugenia Kumacheva of the University of Toronto. The scientists tracked the patches formed by different synthetic polymers—versatile and common compounds used in everything from plastics to electronics—on the surface of gold nanospheres thousands of times smaller than the width of a single human hair. To visualize the elusive surface structures, Kumacheva and her team turned to cutting-edge facilities at the Center for Functional Nanomaterials (CFN), a U.S. Department of Energy (DOE) Office of Science User Facility at DOE’s Brookhaven National Laboratory. "We wanted to probe these nanoparticles from every angle and capture each three-dimensional feature," said study coauthor Huolin Xin, the Brookhaven Lab CFN scientist who led the visualization efforts. "We deployed a technique called low-dose transmission electron tomography to generate this unprecedented, nanoscale insight." The data revealed that variations in polymer length, and the size and shape of the gold nanoparticles, dictated the resultant structures. For example, some patches formed in large clumps on nanospheres while others formed around the corners of differently shaped nanoparticles. Figuring out how to manipulate these patches gives scientists a new precision tool for manufacturing at the nanoscale. 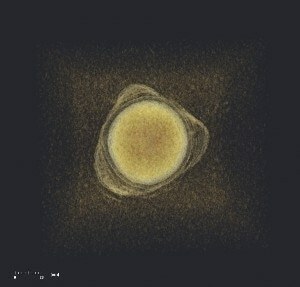 As an example, Kumacheva’s team attached polymers including common polystyrene, a type of plastic, uniformly across the surface of gold spheres ranging from 20 to 80 nanometers in diameter. They mixed these particles in solutions with different solvents that caused the polymers to interact and automatically form distinct patches. "Imagine a dog's fur coat just when it comes out of the water," Gang offered. "Based on the length and thickness of the hair, or the shape of the dog's body, it will clump in very different ways. Our polymer morphologies are a bit like that, where you have a huge range of 'breeds' that emerge when wet. The key difference, beyond the scale, is that the patch patterns change the structural properties of the nanoparticles." To control the patches and perfect their chemical recipes, the scientists needed to catch every detail of these subtle patterns. In electron tomography, electrons from a transmission electron microscope (TEM) bombard specific areas of the atomic structure of a given sample. Some electrons pass straight through while others scatter. Detectors then track the electrons’ paths and reveal the details of their journey. Scientists use the data to assemble 3D models of the particles’ structure and composition. This is already painstakingly precise work, but the patchy particles presented a unique challenge. "The gold cores of the nanoparticles are dense with electrons, so they’re easily tracked by the microscope—not so with the polymer patches," Xin said. "What’s more challenging is that the polymer can be easily blasted and damaged by the intense electron beam. So we had to tweak the illumination and exposure, so to speak, tuning the TEM beam to catch even the low-contrast surface with the lowest electron dosage possible." CFN houses a low-intensity TEM that caters specifically to these kinds of experiments where imaging without causing damage is essential. "We brought this project to the CFN not only to take advantage of this excellent instrument, but also to collaborate with their in-house experts," Kumacheva said. "This work confirms our theoretical models and predictions, which is truly exciting." The 3D imaging revealed otherwise imperceptible ridge-like structures dictated by the interaction of the polymers with the nanospheres. Directing and visualizing such detailed design was a fundamental accomplishment. It remains to be seen how such controlled synthesis could be put to use. "This is foundational work that lets us begin testing and tailoring these customizable nanoparticles," Kumacheva said. Other collaborating institutes include the Russian Academy of Sciences, the Saint Petersburg National University of Informational Technologies, and the University of North Carolina, Chapel Hill. This research was supported by the Connaught Foundation and the National Science and Engineering Research Council of Canada, the Russian Foundation for Basic Research, the Government of the Russian Federation, the U.S. National Science Foundation, the U.S. National Institutes of Health, and the Cystic Fibrosis Foundation. The work at Brookhaven Lab’s CFN was funded by the U.S. DOE Office of Science.